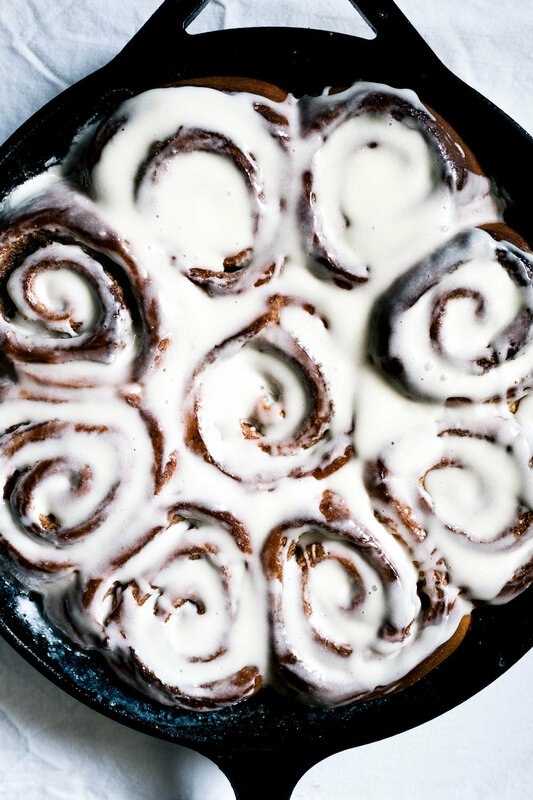 Cinnamon Buns — always with butter. dough. Combine milk, 2 tbsp sugar and yeast in a small bowl. Let sit for 5 minutes until all bubbly. In the bowl of a stand mixer, fitted with the dough hook, add all the dry ingredients and mix to just combine. Add in the milk mixture and start to mix on low. Once it starts incorporating add in the egg. When the dough begins to form start to drizzle in the butter. Scrape down the sides of the bowl to make sure there is no flour stuck to the bottom. Turn up the speed to the second notch and let knead for about 5 minutes until smooth and elastic. Place in a greased bowl and cover tightly with plastic wrap. Let sit in a warm place for about 2 hours until doubled in size. Then remove the plastic wrap, punch down the excess air from the dough and cover again tightly with the plastic wrap. Chill for 1 hour or up to overnight. filling. Whisk the sugar, cinnamon and salt together in a small bowl. Leave separate from the melted butter. Remove the dough from the bowl and place on a lightly floured surface. Roll out to a 10 x 16 inch rectangle. Brush the entire surface with the melted butter. Sprinkle the cinnamon sugar over evenly. Starting at the end closest to you (the long side of the dough), roll dough up into a tight coil, pressing lightly as you roll to make sure there are no gaps between the dough and the filling. Cut log into nine even pieces, about 1 3/4-inch thick. Lightly spray a 9 x 13 inch baking dish with nonstick spray, or a very large skillet if your like me and that's the biggest dish you have. Arrange the buns evenly in the dish. Cover loosely with plastic wrap and let rise until almost doubled, about 2 hours. Bake buns until golden brown and filling in bubbling, about 35 minutes. icing. While buns are baking, whisk together all of the icing ingredients until combined. Immediately after you pull the buns out from the oven, drizzle with the icing and let cool slightly. Eat warm. Another cinnamon bun recipe. I couldn't even begin to count how many different cinnamon bun recipes I have made. Not that I haven't liked any of them, the complete opposite. I generally love every recipe, any slight variation between fillings, spices, sweetness, texture of the dough makes them all unique. They are just one of those things I love to bake and eat. Ever since childhood they have been my favorite. This recipe doesn't disappoint, very classic and traditional. One thing that I always do for any cinnamon bun recipe, pour the glaze, icing, whatever the topping is, immediately when you pull the buns from the oven. It will make the glaze melt and get in all the crevices of the buns. So much better than just sitting on the top of the buns.